new fenders all around AND a back bumper and probably front also. I dont really want OEM I would like something that looks nice but isnt too low to the ground as my car is already lower 2 inches. I live in West Virginia where pot holes are the state animal. I can paint them myself i just need a body kit thats doesnt say ricer and wont hit the ground at the first hole I hit. I've looked at all kinds of body kits but I dont know how low they are. I know the (Wings West RS- "Racing series") Body Kit isn't too ricey. It's what I'm getting for my lude. Not sure how low it is, but i've seen it in a couple Prelude tribute vids on youtube, and it doesn't look much lower than the stock kit. 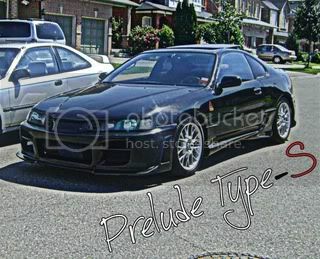 I'm sure you've already seen it, but I think it's one of the more clean looking body kits for a 4th Gen Prelude. thanks now I just need front and rear fenders! IMO, the original OEM fenders look good with the WWRS body kit.